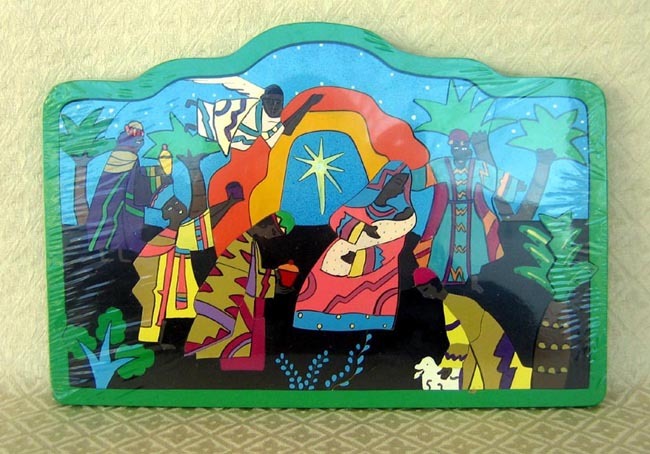 This wooden Nativity puzzle was handcrafted in Sri Lanka. The item was created by Gospel House Handicrafts, Ltd. Gospel House Handicrafts was started in 1976 by John Karunaratne, a Christian, who wanted to provide vocational training for boys from the poor areas in Colombo, the capital of Sri Lanka. In the beginning, John trained the boys to make wooden toys, using two home-made lathes he set up in his own home. As the workforce grew and orders increased, a larger facility was needed and funding was secured to buy land and build a workshop in Madampe, 40 miles outside of Colombo. With the help of TEARCRAFT, a British ATO, the workshop now employs 30 woodworkers: 12 skilled, 10 semi-skilled, and 8 trainees. The item measures 8.25 inches high by 12 inches long.